darkFunction Editor is a free, open source 2D sprite studio that allows you to rapidly define spritesheets and build complex animations, which can be exported as animated GIF's or as XML to be loaded into your game engine. No more messing around in paint programs or manually tweaking coordinates! 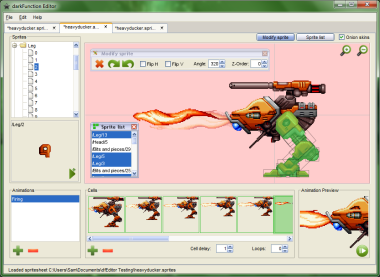 Create animated GIF files from your spritesheet image. Make a sprite by double clicking the image- no need to manually select every sprite. Build animations from your sprites with support for rotation and multiple sprites per frame. Preview the animations as you work. Pack all your sprites into a texture with a single click. 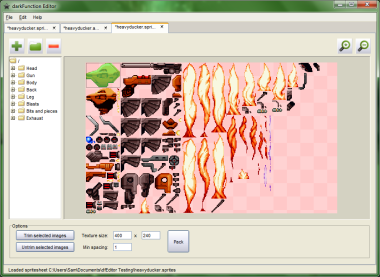 Change any colour in your spritesheet image to transparent instantly! No need for image editing software. 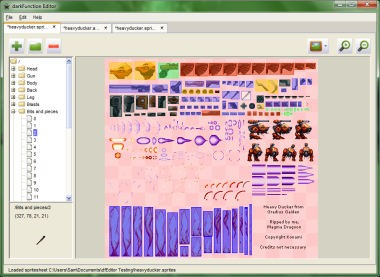 Work with any layout of spritesheet, using fast automatic grid selection or manual definitions. Outputs simple XML that you can import into your game. Will run on any Java-enabled machine. darkFunction Editor is free and open source.